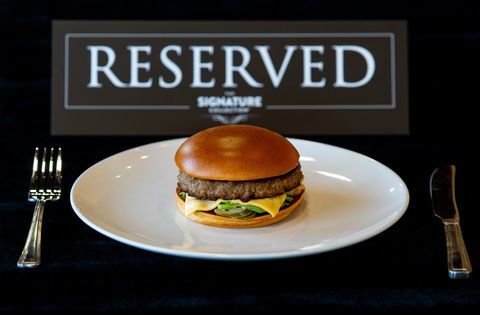 The McDonald’s High Street Kensington store received a one day only VIP makeover yesterday to launch the brand’s new Signature Collection of burgers. Worlds away from the late post-night-out cheeky McDonald’s experience that many of us are used to, lucky visitors were welcomed by a red carpet, uniformed butlers, a string quartet and tables were strictly reservation-only. The interior was also exquisitely decorated with burgundy drapes, ornate candelabras and more cutlery than has ever been seen in a McDonald’s branch. The one-off pop-up was designed by Made in Chelsea’s Mark-Francis Vandelli and was a publicity stunt for McDonald’s new Signature Collection. Guests could choose between three types of burgers – The Classic, the BBQ and the Spicy. The new menu was created by the Chefs Council, an elite group made up of food specialists and chefs that had a chance to work in world-class famous Michelin Star restaurants and cooked for royalty.